Although 1999 was a slow year for kit releases, it ended with a flourish, and one of the best is the Hasegawa 1/48 scale Hsl29. 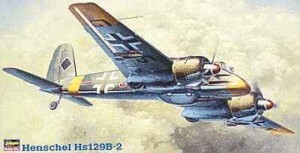 This is an all new tool of an extensively used ground attack plane; the Hsl29 is like the modem day A-10. It was small maneuverable, armored, and heavily armed. With the advent of the new Hasegawa release, the Esci kit of the same plane is basically rendered a collector’s item For people that like to build, this is the kit. The kit is on seven light gray sprues with a clear sprue for the windscreen, gunsight landing light, and canopy. There are also 4 poly caps. Only two are used in this version for the props. Panel fines are delicately engraved on all parts. Construction starts with the cockpit, which has three options for the instrument panel: paint RLM 66 and drybrush (like Monogram), paint and use the kit supplied decals, paint and punch out the decals for individual use. The cockpit is small and cramped like the real cockpit, which had the instruments for the engines located on the nacelles. Hasegawa has also supplied decals for these. No seat belts are provided, so we’re on our own there. The fuselage halves mate well, trapping the cockpit. Hasegawa has gotten the gap between the rudder and the tail just right. Now for an important note:-the nacelles and propellers are not interchangeable. The Hsl29 countered torque by having counter rotating propellers. They and the nacelles need to be kept labeled until installation. Depending on variant and armament, there are holes which need opened in the wing (for the bomb racks) and the nose (cannon support for the N& 103 cannon). A quick tape job shows what looks to be a very promising fit. The landing gear (weighted tires) and ailerons/flaps are added along with the ventral gun. The ailerons are duplicated and are held onto the wing by four supports per side. There are two options for the gun, either a N& IO I or a N& 103. They were both 30mm but looked different and had different bays. The engines are very nicely cast as a bank of cylinders. The engine nacelle fronts are 9 pieces. As with the rest of the kit, there is some over engineering so that Hasegawa can do its magic and produce the many variants and decal options. This is apparent in the design of the nose, engine nacelles, exhausts, and various hatches. Hasegawa has become a master of this, and since the Hsl29 was used on many fronts, there are a lot of possible options and will probably be a lot of Hasegawa variants. There are two aircraft options given, 8(Pz)/SG I and 14(Pz)/SG9. Both of these aircraft are RLM 70/71 over 65. Decals are included for both variants and include a lot of stenciling.